Owen Knowles, A Conrad Chronology. Second Edition. Basingstoke, Hampshire: Palgrave Macmillan, 2014. 243 pp. £55. This well established series fills a crucial gap in the academic market, between author biography and interpretive scholarship. Where a biography tells the story of a subject’s life, with the inevitable inflections accorded by the biographer; a chronology presents the basic facts of that life unadorned, reducing it to the bare dates and events. Each volume in Palgrave Macmillan’s ‘Author Chronologies’ series - whose blossoming range of subjects already extends from Sir Philip Sidney, Christopher Marlowe and John Milton to Samuel Beckett, George Orwell and Harold Pinter - provides the factual details of an author’s life, often allowing for a day-by-day account of the life out of which his or her literature emerges. In the case of Joseph Conrad (1857-1924), biographers have done well to locate the source materials that shape his life. So rich and varied are its patterns that one recent biography chose as its title The Several Lives of Joseph Conrad. Born Józef Teodor Konrad Nalecz Korzeniowski into a family of ardent Polish patriots in the Russian-annexed Ukraine, Conrad spent two decades as seaman, largely in the British merchant service, travelling in the colonial world, and then spent his final three decades, mainly living in the Kent countryside, drawing upon his experiences as an English author, writing in his third language after Polish and French, and producing nearly thirty volumes of fiction and essays that would not only redraw the contours of the English novel but also see this émigré Pole regarded as one of the exemplars of our literary style. Telling the story of this life has occupied biographers for nearly a century now, and their respective approaches - national, maritime, psychological - have organized the facts to serve different narratives. The overwhelming advantage of a chronology lies in its presentation of these bare facts, inviting the reader to compose the articulating narrative and, typically, affording the textual scholar direct access to the life from whence the art emerges. 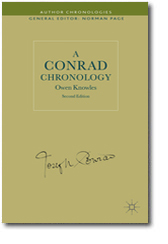 Unsurprisingly, Owen Knowles’s A Conrad Chronology, first published by Macmillan in 1989, quickly became an indispensible reference work for Conradians. But the details of a life lived a century ago are necessarily dependent upon the current state of historical scholarship, and recent advances in archival research and genealogical findings, together with the completion of the magisterial nine-volume Collected Letters of Joseph Conrad and the reinvigorated Cambridge Edition of the Works of Joseph Conrad, that now boasts 13 volumes, have all meant that it was timely to update A Conrad Chronology. When the first edition appeared, a mere three of the nine volumes of The Collected Letters were in print. Knowles’s Second Edition makes excellent use of the complete correspondence - and helpfully cross-refers to volume and page number in the Collected Letters, providing an incentive to the reader to delve further - together with other recent research findings to supply new information, confirm (or deny) incomplete or speculative detail and provide the most precise and succinct record of Conrad’s daily life available. As Knowles says in his ‘Preface to the Second Edition’, it is the publication of Conrad’s correspondence that has made the greatest contribution to the updated the Chronology. The Chronology is simple to use - but its easy access to the days, events and encounters of Conrad’s life cannot detract from the effort that underpins it. Knowles has, once again, done a great service to Conradians and to future Conrad scholarship. The increased scope of the revised Chronology is quickly apparent: the ‘Early Years: 1857-73’ sequence has expanded from four pages to six, ‘Sea Years: 1874-93’ from 12 to 20. Everywhere, new details flesh out the life. For instance, to the list of friendships Conrad made during his voyages in the Torrens the Chronology adds Walter Banks, a civil engineer from Lancashire, who travelled to Australia in November 1891. This detail is embellished with news that the men met fairly regularly when they were both back in London, and is then followed up with the detail that, on 25 November 1893, Conrad looked forward to meeting Banks for a game of chess. From the steady accretion of such subtleties a richer sense of the life emerges. The meticulous nature of Knowles’s revision and correction is engrained in the new edition, confirming, if confirmation were needed, its importance and usefulness to both the Conrad scholar and the general reader wanting a succinct and accurate chronology of Conrad’s life. For example, where the first edition records that, on 3 July 1909, Conrad received a volume from Arthur Symons, ‘probably’ The Romantic Movement in English Literature (1909), the second edition corrects this to Symons’s London: A Book of Aspects (1909) and a manuscript of his poem ‘The Fires of Youth’. Similarly, where the first edition records, in an entry dated 19 July 1909 that Conrad has ‘recently spent’ two days with Reginald and Maisie Gibbons, the second edition records that this two-day stay began on 15 July. Inevitably, when he exchanged the quarter-deck for the writing desk, not only did the volume of Conrad’s correspondence increase exponentially, but also that it would provide the most comprehensive record of the day-to-day details, the significant events and the commonplaces, of his life. Knowles is fastidious in his attention to such minutiae. In consequence, the main body of the Chronology, covering Conrad’s life as a writer, from 1894 to 1924, has expanded by 50% from 108 pages to 158 pages. The rewards for the reader are obvious as the life steadily merges from the accumulation of factual detail. For instance, in the first edition, Conrad’s relationship with J. M. Barrie was conveyed in three entries: on 14 November 1903, Barrie gave the financially-strapped Conrad a gift of £150; on 5 November 1904, Conrad sent Barrie his one-act play, One Day More, written earlier that year, for scrutiny; and on 27 November 1917, Conrad, John Galsworthy and Barrie dined together at Romano’s, a restaurant on the Strand. In the revised edition, these are expanded by three further entries: first, at the end of 1903, a month after receiving Barrie’s generous gift, Conrad confessed to him that 1903 had been a ‘disastrous year’, and had recently read Barrie’s The Little White Bird (1902); second, in March 1908, when Conrad applied (successfully) to the Royal Literary Fund for a grant, his sponsors were John Galsworthy, H. G. Wells and Barrie; and, third, on 6 December 1917, shortly after the dinner at Romano’s, Conrad celebrated his birthday with a dinner at the Royal Automobile Club in Pall Mall, with Barrie among the guests. The supplementary details typify the manner in which, in the Second Edition, the lineaments of a life acquire vitality. While updating the facts of Conrad’s life remains the achievement of the revised Chronology, Knowles retains a keen sense of his reader, and so, typically, colours dry detail with vibrant, supportive inflection. In 1908, as an antidote to the slow composition of Under Western Eyes, Conrad decided to compose the series of autobiographical sketches that would be published as A Personal Record. He revealed his plans in a letter to his long-suffering but increasingly-irritated agent, James Brand Pinker, on 18 September. As the first edition reveals, Conrad’s letter demanded Pinker’s total support for this venture. These are the facts. What more detail could one want? In the revised edition, the detail is generously inflected with a quotation from the letter: ‘If you are not disposed to [help] … then my writing career must come to an end for I cannot pursue it under a hedge’ (CL, IV, 124). Such grace notes help to make the Second Edition such a delight not just to consult but also to browse. But, despite such inflection, it is the sheer weight of added factual detail that is so impressive - and nowhere is this more apparent than in Conrad’s later years. A single representative example will suffice. On 1 May 1923, Conrad arrived in New York for a month-long promotional visit, as the guest of his American publisher, Frank Nelson Doubleday. The visit is well recorded, as demonstrated by the six entries for the month in the first edition. In the Revised Edition, these expand to fourteen entries. Here one finds diarized such detail as when Conrad found time for sightseeing in New York (8-9 May) and where he stayed during his tour of New England and Boston (the Phelpses in New Haven on 15; the Copley-Plaza Hotel in Boston on 16). The updated chronology includes the anecdote about F. Scott Fitzgerald and Ring Lardner’s failed attempt to meet Conrad by dancing drunkenly on the lawn of Doubleday’s estate on 5 May. Supplementing the actual ‘Chronology’ are various helpful appendices, including ‘Select Who’s Who’ and ‘Locations and Addresses’, that also benefit from recent findings by biographical scholars as earlier entries are expanded and updated and new ones introduced. For instance, the entry on Jane Anderson had doubled in size and now includes details of her life after the First World War, while the terse original entry for William Blackwood, some 300 words, has been revised to provide more detail and now includes suggestions for further reading. Indeed, a feature of this gazetteer is its awareness of recent findings and their contributions to biography. Omissions in the first edition are repaired, so there are now entries for J. M. Dent and Elsie Hueffer, and Eric Pinker is accorded his own entry, his importance in Conrad’s life doubtless emphasised by the author’s day-to-day dealings with him after he took over management of the agency on his father’s death, as recorded in the later volumes of The Collected Letters. Where earlier scholarship has been superseded by subsequent research, as is the case with Norman Douglas or Ford Madox Ford, new sources and suggested reading are introduced to replace former, out-of-date ones. Once again, it is the attention to fine detail that is most impressive: thus, the Second Edition provides Marguerite Poradowska’s full name and revises the entry for Joseph Spiridion Kliszczewski as Józef Adolph Spiridion, the name he went by in Britain (and in the process confirms the year of his birth, from ‘1849?’ to ‘1849’). Seemingly slight in themselves, it is upon such grains of accuracy that the edifice of scholarship is founded, as records are authenticated and, where contemporary evidence underscores historical speculation, knowledge is secured. ‘Locations and Addresses’ also benefits from the updates - the Conrad’s home in Aldington is added, as is the London Sailors’ Home - and the Second Edition takes the opportunity to update the Select Bibliography accordingly and to add a further map, of Conrad’s Malay Archipelago. Historical chronologies, like biographies, depend upon knowledge that is still emerging. Thus, they will always be incomplete. But as this Second Edition of A Conrad Chronology demonstrates, thanks to ongoing research new findings are always being made. Who did win that chess game, Banks or Conrad? And, in how many moves? We do not know. Yet. We shall just have to wait for Knowles’s Third Edition to find out.